Hello and welcome to the 507th installment of the SWD. Five elements of the Islamic State and an element of Jund al-Aqsa escaped from Hayat Tahrir al-Sham-held part of Idlib Central Prison. Syrian Salvation Government, which holds the other part of the prison confirmed that several individuals escaped from it. Al-Jabhat al-Wataniya lil-Tahrir (National Liberation Front) conducted security operations in Sahl al-Ghab and Jabal Shashabo regions, targeting individuals who promote reconciliation with the Syrian government. According to the reports, Al-Jabhat al-Wataniya lil-Tahrir arrested around 45 individuals during the operations. Abu Amara Special Task Brigade stated that its improvised explosive device killed the director of the ‘Syrian Scientific Research Center’ in Masyaf, Dr Aziz Asber and another individual accompanying him. Syrian Democratic forces during the second phase of the campaign of the island storm (Asfat al-Jazeera) to liberate the eastern countryside of Deir ez-Zour and the border line with Iraq managed to eliminate the last pockets of Daesh. 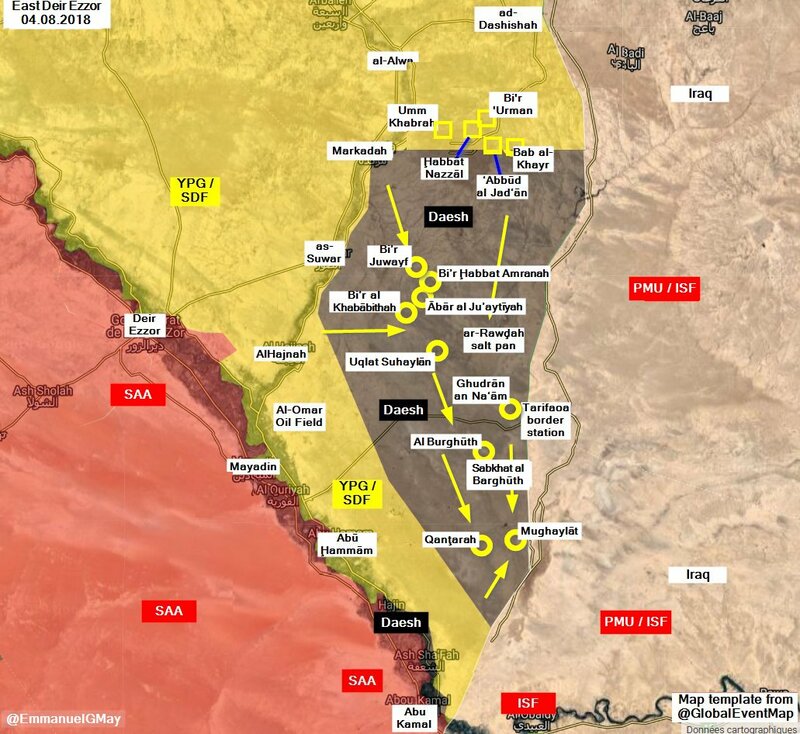 And in the framework of the battles which launched by SDF from three axes, they were able to make significant progress about 37 kilometers to the southeast, in the desert region between Dashisha town and the Far East of the Euphrates River. During those battles, many terrorist organizations were destroyed and many terrorists were captured and the two oil fields of Al-Azraq and Al-Malah used by Daesh to fund his terrorist activities were destroyed. Afghan National Security Forces killed two elements of the Islamic Emirate of Afghanistan (Taliban) in Ghormach district. Afghan National Security Forces arrested five elements of the Islamic Emirate of Afghanistan, as well as destroyed ten improvised explosive devices and a motorcycle in Bajouri village of Archi (Dasht-e Archi) district. Afghan National Security Forces killed seven elements of the Islamic Emirate of Afghanistan in Khwaja Ghar and Baharak districts. Islamic Emirate of Afghanistan overran an Afghan National Army’s post near Ghormach district’s center. Nine elements of the Afghan National Army were reportedly killed in the encounter. Islamic Emirate of Afghanistan seized three PK machine guns and five assault rifles from the post. Islamic Emirate of Afghanistan’s Al-Emarah News stated that the group seized the center of Laja Mangal district, as well as Afghan National Police’s headquarters and a large base near the center from the Afghan National Security Forces. According to Al-Emarah News, 18 elements of the Afghan National Security Forces were killed, eight wounded and two captured, as well as three vehicles destroyed in the encounters. Islamic Emirate of Afghanistan seized two armored vehicles from the captured installations. Afghan National Security Forces killed five and wounded three elements of the Islamic Emirate of Afghanistan in Shinoghul area of Tarinkot district. Islamic Emirate of Afghanistan conducted large-scale coordinated attacks against the Afghan National Security Forces’ positions in Paie Nawa, Sarkhom, and Spin Masjid areas of Tarinkot district. According to the Islamic Emirate of Afghanistan’s Al-Emarah News, the group overran three checkpoints, killing 20 elements of the Afghan National Security Forces in the process. Islamic Emirate of Afghanistan stormed an Afghan National Army’s checkpoint in Mizan district, killing four elements of the army. Two elements of the Islamic Emirate of Afghanistan were also killed in the encounter. Islamic Emirate of Afghanistan’s improvised explosive device destroyed an Afghan National Army’s vehicle, killing one and wounding two elements in Akhunzada Khel area of Seyurie district. Islamic Emirate of Afghanistan’s element infiltrated an Afghan National Police’s checkpoint in Shin Killi area of Nad Ali district and opened fire on elements present at the checkpoint, killing eight policemen. The infiltrator seized a PK machine gun and three assault rifles before joining the nearby Islamic Emirate of Afghanistan’s elements.